Schober's grandfather, Franz (1727-1798) was a tradesman, a master baker and then a stallholding grocer in Altlerchenfeld, on the outskirts of Vienna. In 1752 the 25 year-old married the 19 year-old Katharina Hohenauer (1733-1797), the daughter of a coachman. Katharina bore seven children. We focus on the fifth child, Franz Xaver [von] Schober (1759-1802), who will become the father of Franz von Schober, the friend of Schubert. With Franz Xaver, the family of good bourgeois tradesmen and grocers produced a star. The generations of the Schobers are aligned with the generations of the Schuberts – how could it be otherwise? In the generation of the grandparents, Franz Peter Schubert's grandfather Carl (1723-1787), the flax farmer in Moravia, was a close contemporary of Schober's grandfather, the stallholder Franz (1727-1798). The couples married within two years of each other (Carl and Susanna in 1754, Franz and Katharina in 1752). In the generation of the parents, Schubert's father, Franz Theodor, the school principal, was born in 1763. Schober's father, Franz Xaver, the entrepreneur, in 1759. Franz Theodor Schubert and his brother broke away from farming into teaching and running schools; Franz Xaver Schober broke away from baking and grocery to become a rich, ennobled tradesman. In the generation of the children, Franz Adolf Schober, Schubert's friend, the charming dilettante, was born on 17 May 1796, Franz Peter Schubert, composer, eight months later on 31 January 1797. We are unsure of Franz Xaver Schober's education, but we do know that he went to Sweden in 1781 as estate manager or inspector for Lieutenant Colonel Alexius[Axel] Freiherr von Stiernblad in the Province of Schonen, near the sea port of Malmö. He was extremely successful, not only receiving the praise of his employer and the local farmers for his agricultural innovations but also achieving great success in trading in his own right. Within five years, in 1786, his position was sufficiently established that he came back to Vienna to marry Katharina Derffel (1762-1833), the daughter of the owner of a spa hotel in Baden, Austria – yes, another Katharina. Her father, Dominik Derffel (1729-1775), had built up a reputation as a cook in Vienna. He had bought the spa hotel Petersbad shortly after Katharina was born. He developed and extended the hotel until it had 84 rooms and a high reputation for its comfort and – of course – the quality of its catering. If you couldn't soak your way to health, at the Petersbad you could at least eat your way to health. Dominik died young, only 46, having had only a little over ten years in the Petersbad. His widow died only five years later in 1781, the same year that Franz Xaver Schober left for Sweden. Katharina, 13 years old at the death of her father and 19 when her mother died, was looked after in the family of Dominik's sister-in-law until her marriage to Franz Xaver in 1786. 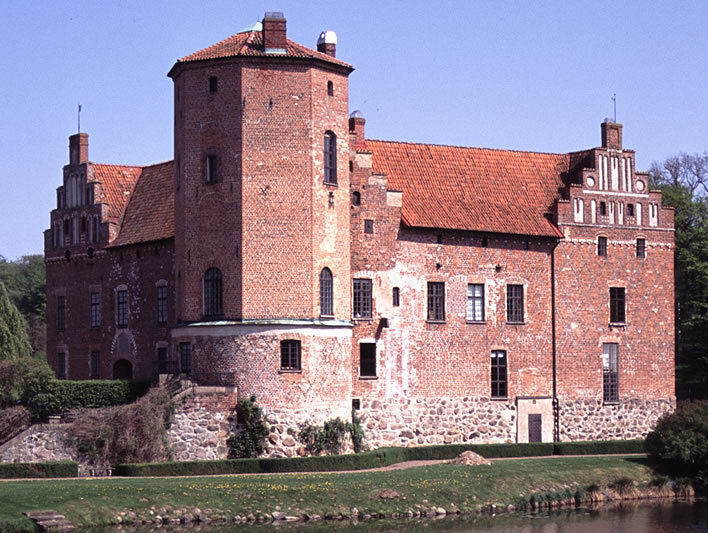 It was possibly about this time that Franz Xaver is supposed to have bought Torup Castle, about 15 km from Malmö. Failing an accurate documentary record on this point, it seems more likely that he rented it or a part of it from Baron Stiernblad, who had only taken it over a few years before in 1783. The births of the Schobers' four children were all registered there. Schubert's Schober, Franz Adolf von Schober (1796-1882), was the last of the four. Franz Xaver's meteoric progress continued. In 1801 his service – but mainly his money – acquired for him a title of nobility as Franz Xaver Freiherr von Schober. The grocer's son had come a long way. He was not given long to enjoy his nobility: the Grim Reaper came to call for him in Torup the following year, 1802. He was 52. Never mind: his 40 year-old widow was left with an substantial fortune, about 600,000 Gulden. How much is that worth today? An awful lot. There is little point trying to put a modern number on this amount because the goods and services that were available then and their prices are so different from those today. As a rough guide, we note that Otto Erich Deutsch estimated that Franz Schubert earned in his entire working life just under 9,000 Gulden. It appears, though, that after 15 years in the mid-16th century Swedish castle Katharina was still a stranger in a strange land, for she returned to Austria, back among her own kind, soon after her husband's death. Franz Adolf Schober, the future friend of Schubert, was five years old when his father died. What was Franz's early life like? No idea. Was he a good boy? a bad boy? a mummy's boy? No idea. We can be fairly sure that he grew up speaking German – with an Austrian accent, we can reasonably assume – and presumably some Swedish, too. In 1803, when he was seven, he was packed off to a boys' school in Germany. 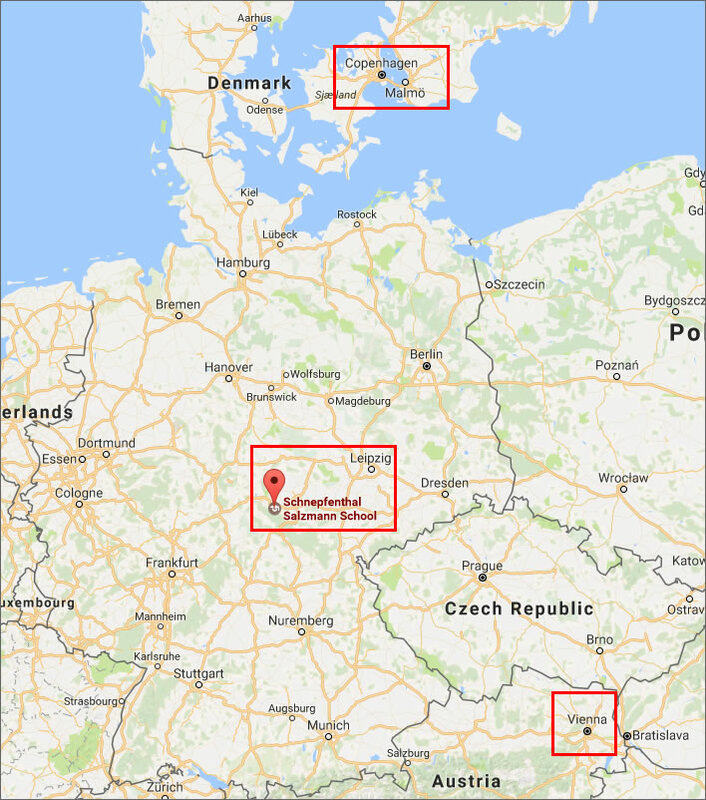 The school was the Salzmannschule in Schnepfenthal, in Thuringia, in central Germany. 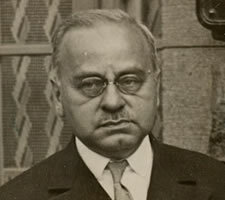 Christian Gotthilf Salzmann, the founder, placed an emphasis on language learning, a speciality that is maintained in the school to this day. His older brother Axel (1789-1817) had been attending the school since 1800, so there was at least one familar face there for the seven year-old. There were 56 pupils in the school at that time. 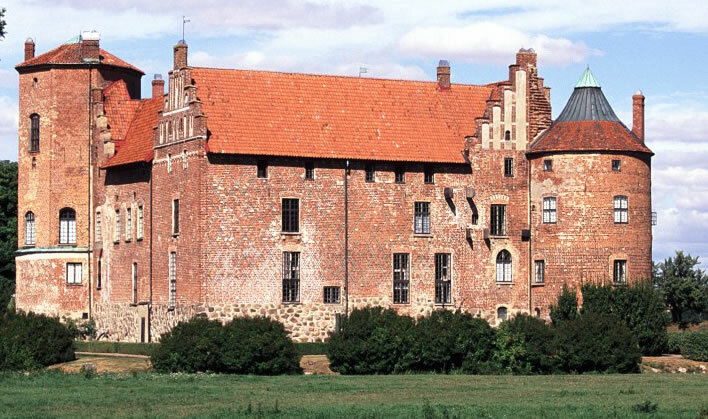 Malmö (Torup is 15 km to the east); the Salzmannschule in Schnepfenthal, Germany; Vienna, Austria. Franz Schober is not mentioned in the lists of outstanding pupils in the school, so we can assume his performance was nothing special. Was he a good scholar? probably not: Salzmann, the founder of the school, writing to Franz's mother praised his 'industry and good behaviour', which has been down the centuries a positive way of saying that the child is not academically outstanding. After all, it was a fee-paying school and pupils meant income – best not insult the children to their parents. Nevertheless, in his later days Schober would credit the school with his 'breadth of knowledge for a child of his age'. Was he happy there? Probably – the school newsletter speaks of the touching pain he felt at his farewell from pupils and teachers when he left the school. It appears to have been a humane and enlightened – though spartan – regime according to the standards of the times. He even kept in contact with Salzmann's sons for nearly fifty years after he left, so his time at the school can't have been bad. In fact, in comparison with the crashing boredom, regimentation and mindless routine of the Jesuit and Piarist schools of the Austrian Empire, Schober's life in Salzmann's school may have been relatively liberating. As examples of the normal we need think only of the Gymnasium in Brünn, through which Franz Schubert's father and uncle slogged their way, or the Piarist Gymnasium in Vienna that Schubert himself attended. Which in turn might explain some of the astonishment the young, repressed Austrian men felt at the mature, easy and wide-ranging conversation of this strange creature who, unlike them, had almost completely avoided the remorseless crushing of the millstones and the grinding conformity of a Jesuit education. In Salzmann's school he learned to speak a German free of the Austrian dialect he must have used at home in Torup, an ability that would help him in his brief acting career in north Germany later in life. The Austrian dialect would not have been lost: it would have been the lingua franca among the young men of the Schubert circles, meaning that Schober was immediately 'one of them' linguistically. Franz Schober seems to have spent three years in Salzmann's school, but we don't know exactly when he left. He first joined his mother in Vienna and attended the Academic Gymnasium there. She obtained a scholarship for him in 1809 at the Kremsmünster Stift, a boarding school for boys run by the Benedictine order. He was there until 1815. The scholarship grant was important, because although Franz Xaver, his father, had left an immense amount of money to his mother, it took several years of legal and financial machinations to get the money out of Sweden and into Vienna.